American endurance driver Deena Mastracci intends to walk into the DMV in Santa Clarita, California on June 1 and get her motorcycle license, and then immediately set out on a 9,000-mile motorcycle journey as her “first ride.” But not just ANY 9,000 miles, because Deena’s route includes portions of Alaska, the Arctic Circle region, the Yukon, and finally, through the Midwestern United States where she will then conclude the ride in Pennsylvania. Deena plans to use her journey to call attention to the work of the Motorcycle Relief Project, a nonprofit charity that helps veterans with PTSD and other injuries. “I am taking on this challenge to show women, veterans, or anyone intimidated by something new that the best way to overcome that fear is to drive through it,” Deena states. She’ll also set the record for the longest journey completed by a newly-licensed motorcycle rider. She’ll be accompanied by her fiance and fellow endurance driver Carl Reese, and by paramedic Jeremy Fox, both on their own motorcycles. I was interested – and glad – to see that International Female Ride Day will now be held on a Saturday. This means I (and millions of female riders like me who are tied to the US version of a “work week”) will not have to burn a vacation day to participate. And participate I will! Now make no mistake, ANY day I ride is a “female ride day” – and I don’t depend on a designated day or month to validate me as a female rider. But I don’t begrudge the fact that there IS a designated day – in fact I think it’s kinda cool. And I’ve always wanted to be able to say that I rode with millions of women worldwide on IFRD. This year, it looks like I’ll have that opportunity on Saturday, May 3. Here’s the full story, from founder Vickie Gray’s website, Motoress. Thanks to BCN reader Kathy W. for the tip, shared in the comments on my calendar post! 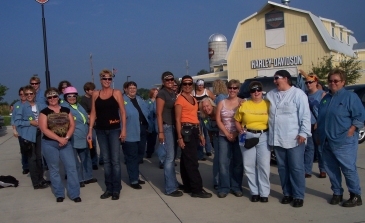 In 2007, “Motoress” Vicki Gray created a day to celebrate women riders. It wasn’t an event with a location, a start time, and a 50/50 drawing. Rather it was just the idea that on a certain day, women would ride in celebration of being women on motorcycles. At that time, Vicki took some time to answer questions from me about the concept of International Female Ride Day, then in its infancy. Now we’re seven years down the road, and it seemed like a good year to do an update with Vicki. 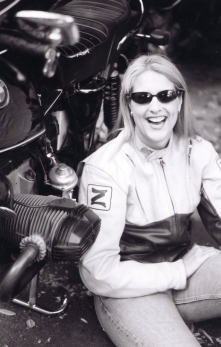 So here we go: a brand new and exclusive Q & A with International Female Ride Day Founder, Vicki Gray! BCN: This will be the 7th year for IFRD. Do you have a sense of how large it has grown in that time, or anything in particular that you measure that illustrates the expansion of the concept? Vicki Gray: IFRD has blown up in global participation and especially with the assistance of Facebook, social media and our now web-savvy civilization. Its been in the past four years that the boom has really evolved because the word gets out there and women are more comfortable with the internet and have been making it a part of their daily ‘connecting’ lives. I can’t tell you the numbers who participate but it is thousands! And not all women report in on the day. Many women just enjoy riding – they get out there and are not needing to share their actions. If you do a search on Facebook alone for International Female Ride Day there are oodles of events. Women are thrilled about this action all over the world and it’s not diminishing–its become bigger and bigger every year embraced by women riders the planet over. Each year women collect the annual t-shirt – and book the time off work from what I’ve seen via messages, as early as eight months out. It is something that is embedded in our love of motorcycling – there are so many reasons this day will continue to rise – its truly part of our women’s riding culture now. BCN: What is most satisfying to you about having started IFRD, considering the scope of it today? Vickie Gray: The best part for me is meeting the most amazing women riders the world over! I can tell you honestly, I know a lot of women who enjoy motorcycling! I’m very fortunate. It’s been seven years that I’ve been on the direct receiving end of pretty much every question or enthusiastic comment. I’ve received emails upon emails of triumphant women who have come forward in their lives, in their cultures, in their regions through motorcycling and what this day means to them. One of the best events I recall was the first time a group of women riders rode through the streets of Tel Aviv on IFRD which had never been done before in history. BCN: Do you have any notion of how many miles are racked up on IFRD, worldwide? Vicki Gray: No idea. And it’s not about the miles or kilometres, it’s about getting out there. Whether you opt to take the motorcycle to work on IFRD rather than the car – and ride only 10 kms – you did your part. You got out there and represented women riders and inspired others. BCN: What do you still hope for IFRD in the future? What would you like it to become? Vicki Gray: I hope it continues for eternity! I hope it becomes an official day in all countries. I started this as a woman motorcycling advocate; I had many goals/dreams with it , and one (was) the demonstration of the many numbers of women riders. We’ve always been there and I wanted us to show the world our numbers. Of course there’s a feministic women-power part to this goal as well. The days are disappearing, and have in Western cultures, of women being in and taking the back seat – we buy houses alone, we run businesses and we charter our own paths. But of course, its still up to women to choose the way they wish their lives to play out. And what’s happening now in the evolution of International Female Ride Day is a massive bringing together of like minded women through all cultures and nationalities. This was the plan and I think this link is the substance which will keep International Female Ride Day going. In a world where we know unity, sisterhood is the strength which will make changes for our world as women going forward- and is! Though, funnily enough there are as in any case, many women who’ve through one reason or another, tried to dispute the date, hold it on another day – quite simply- it’s always been my policy, if you don’t like the criteria, don’t get involved. I must laugh, as obviously this idea and its huge global success struck a chord with women! You can see by the massive success of this campaign and the passion women have for it, it’s working. The women who’ve picked up the torch and carried it on every year – it’s been their choice to support the date with little effort from my side. I’m truly honoured! There have also been attempts and particularly by one large global manufacturer to take this idea, this day and rebrand it for their own. It’s been difficult for me keeping this event just for women riders – an all-brands focus. Unity, no discrimination. I think the most difficult part for me is that I do it all for free. I’m self employed, a struggling entrepreneur, and this costs me time, effort and of course financially. Sure I produce some t-shirts but the profit is nothing to speak of. My gain is simply for the mission, which is at the truest core of my heart – to expand the knowledge, change the perceptions and reap the pleasures and rewards motorcycling provides us- on all its levels. BCN: Is there anything specific about IFRD for 2013 that you would like readers to know? Vicki Gray: Just that the women who join in and have in the past to JUST RIDE on International Female Ride Day are truly unique, inspiring, incredible examples of tremendous ability and spirit. Through all ages, experiences and cultures women have joined together our power and passion through something that’s so fun and rewarding. This example is a great bench marker for others. Community is strong and women are demonstrating that simply by taking the handlebars! Sincere thanks to Vicki Gray for taking time to answer my questions once again! 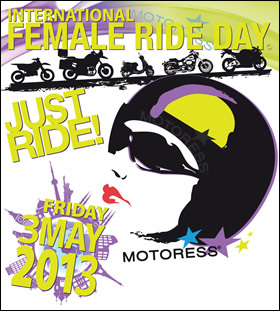 International Female Ride Day 2013 is Friday, May 3! Incredibly enough, it’s snowy again here in Iowa so my riding plans have been thwarted by Mother Nature. But I hope YOU will get a chance to JUST RIDE! This guest post is by author and photographer Christina Shook, who has just released a photographic essay book called “Chicks on Bikes.” The book captures the stories and pictures of women riders from all walks of life, but the essay excerpted here captures the essence of what we all have in common – a sense of sisterhood. Sisterhood. A community. Of women. Not a sewing circle, not a women’s auxiliary club, not a mom’s club. There is a community of women bikers. Today women have formed organizations for every interest under the sun, no longer limited to domestic, nurturing or supportive activities. These women have taken up a lifestyle that is still a largely male domain and claimed their space and culture within it. Few groups have the high-impact visibility of a pack of women riding up on their bikes. Few events have the singular sense of power that wells deep within as dozens of women roar their engines at the beginning of a group girl ride. It is a screamingly , throbbingly, wonderful feeling. It’s awe inspiring and fascinating to behold. There is a sense of non-competition in a group of women, an unspoken sisterhood without the need to prove you’re daring. Women ride a little safer, a little smarter, a little kinder. To be on the road simultaneously alone and part of the pack is to have a firm sense of self and belonging. Every decision on the road must consider both self and group. Riding down the road with a mother, a sister or girlfriends combines the sense of the feminine with a sense of power. It spells out strength, pride, power and independence. There are millions of women on motorcycles, and numbers count. There is strength in numbers. There is a kinship all motorcyclists share born of hardship and joy. Women motorcyclists have existed since the days when women wore dresses and rode side saddle. There are women motorcycle clubs that drink beer, swagger and ogle men. Some ride for causes such as breast cancer or children’s health issues. Some are Christian groups that go riding after church on Sundays. there are countless groups that represent every lifestyle imaginable. They will all tell you it’s different from riding with the guys. there is a sense of pride and sisterhood, and this is why they ride with the girls. To learn more about Christina and her book, visit www.ChicksOnBikes.us. Get your copy by clicking the “Order” tab on her website. You can also read her blog, http://cshook.wordpress.com/ – she just got back from the Women and Motorcycling Conference in Keystone, Colorado – and follow her on Twitter (www.twitter.com/cshookup) for tweets related to photography and motorcycles. It’s Women Riders Month – let’s ride! The Harley Davidson company has proclaimed (among just a little bruhaha) May to be Women Riders Month, with a variety of events and celebrations planned to call attention to the number of women riders now on the roads. As I’ve pointed out in some of the discussions about the value of a celebratory month, this is HD’s way of celebrating and catering to their growing female ridership. While some don’t see the need and feel like HD is pandering to them, I say that this kind of attention is good. For one thing, it raises the visibility of motorcycling in general. As HD spends time and money promoting its products and programs aimed at women riders, it calls attention to the very facts that a). motorcycles exist and share the road; and b). in the seasonal states, it’s now motorcycle season so drivers should be on the lookout. For another thing, it encourages women who aren’t yet riders to get out there and follow their dream to learn. If a women wants to get off the passenger seat and take control of her own machine, she should absolutely be encouraged to do so. Maybe seeing more women riders on the road will convince others that it’s time to ride. Finally, this celebration should not be and does not need to be limited to the Harley Davidson company. 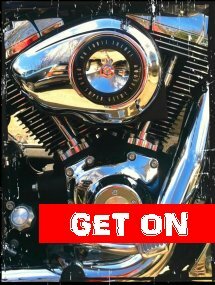 With HD having taken the step of publicly acknowledging and celebrating their share of the women’s market, other groups should follow and grow Women Riders Month to include safety and educational components, local riding celebrations for all makes and models, and more. Just because HD said it’s Women Riders Month, doesn’t mean they’re the only ones who should be celebrating. While HD may dominate the celebration this year, it would be great to see other companies and organizations add more components to it for next year and beyond. Okay gals, enough talk – it’s a bright blue sky, and reaching for almost 70 degrees today. It’s also Demo Days at Big Barn Harley Davidson. Think I’ll go for a ride. How about you?? Motoress.com proclaims May 1, 2009 “International Female Ride Day” – if you’re a woman who rides, I encourage you to get out there and make a spectacle of yourself (um… in a good way, ok?)! 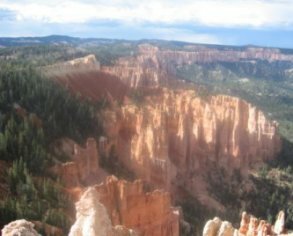 Carole wrote in with a quick report on her recent trip to Utah with Judy (oh, and, their hubbies!) – wow, it looks like a must-ride! Thanks for sharing the trip with us, Carole! 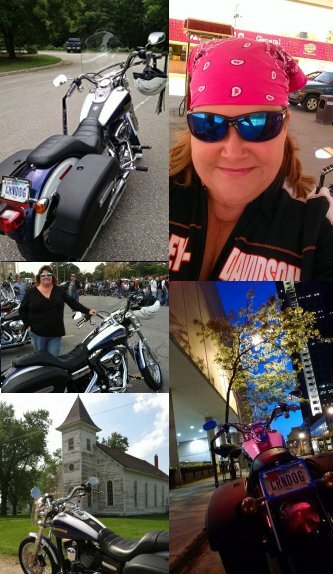 Interview with Vicki Gray, organizer of National Female Ride Day! Racing professional Vicki Gray of Toronto, Ontario, Canada is organizing National Female Ride Day (NFRD) on Friday, May 4, 2007 to encourage and salute all women who ride motorcycles! 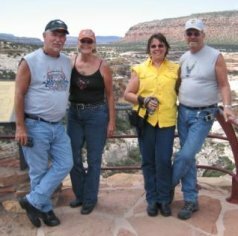 An experienced organizer throughout nearly 25 years of riding and racing motorcycles, Vicki has ridden and enjoys all types of motorcycles. She has taught motorcycling to beginning riders, and taught advanced skills to members of the law enforcement community. Here is Vicki’s complete bio. Back at the beginning of April, I asked Vicki if she would provide some information for Biker Chick News readers about National Female Ride Day. She was kind enough to respond to my emailed questions, and I’ve provided the interview here so you can see what NFRD is all about. My heartfelt thanks to Vicki for her willingness to contribute to Biker Chick News! What spurred the idea for National Female Ride Day? Always wanted to initiate the day, just timing and busyness prevented it from being realised—not failing the past 6 years of my road racing demands in Europe (busy). Now that I’m not officially racing and with the relocation and launch of MOTORESS, the timing was right. There are many activities for women, fundraisers, and clubs yet not once has there been a day to simply celebrate female riders—shine a light on women who ride. In addition, the whole idea behind MOTORESS and my former brand RACEGIRL MOTORSPORT in Europe was to spotlight and encourage female riders. This is an awareness campaign full of encouragement by the many examples of female riders out there. How do you go about promoting something that you want to be a national event? How has your strategy worked? Fortunately, the MOTORESS website and my RaceGirl Motorsport website in Europe enjoy many visitors, so this is one way to spread the word and inform. Additionally, without sounding bold, perhaps my prior reputation—I do have a bit of a background ;-) Europe is a very serious motorcycling and motorsport community. I was intensively active and involved there. Strategy step one was to ensure every dealership in Canada had a poster and a tip sheet in order to support the day. The manufacturer’s were very pleased to get involved, I think particularly as the brand and image of NFRD is rather modern, edgy and reflects confidence. It’s wonderful to see all brands working together. Then there are people like you Janet, supportive, enthusiastic and interested. The entire goal is International Female Ride Day — each year at a time, an additional country. The number of women riders is growing. Why do you think that’s happening? Well, this is interesting; I think its just plain old human development; modern advancements of our culture. Women have been riding, racing and breaking distance records since early late 1800’s. I think today’s woman is more versatile—you might also say why are more women owning cars, houses, vacation properties? The borders within our definitions of being female have expanded and evolved just as everything else in our culture. Plus I think we are no longer standing around waiting for our lives to be defined by a man, as was pretty much the case in the past (50’s). Again, this is simply the advancement of our times/culture. Do you think there are still any real barriers to women becoming riders? If so, what are they? The only barrier I can see is that we are still raised under traditional female expectations — meaning the conditioning of being female, what we are suppose to be doing and not. This all starts at birth. We need to be more exposed to things like motorcycling and shown that it is something a girl can do. Not something dangerous, more of a curiosity, something to explore rather than to be intimidated or frightened of. Often we are our own barriers, not our fault. How many females, non-riders I approach and invite them to try motorcycling. I usually hear—it’s frightening, I might get hurt, going around a corner makes me anxious, its so big, scary, etc. Certainly, things have changed, yet we’d only be fooling ourselves to deny it. Additionally how do we juggle everything in life? Job, partner, career, family/children, pastimes, motorcycling. In my women studies, much is revealed simply in our nature, which can put an activity such as motorcycling at low priority. The motorcycle remains something masculine, not female. What do you hope NFRD accomplishes, in terms of number of riders, or messaging, or whatever measure you are interested in? I hope NFRD demonstrates to our culture(s) just how many women are riding—there are many, and more importantly, there have been many. All ages, all styles (scooter, sport bike, cruiser) and that this day will bring all the diversities together. Shine a spotlight on females, create awareness and encourage others to take it up. It’s not a new idea for women. Bring together, just for one day, the various clubs, groups, types realising we are pretty much doing this for the same reasons—whether you decide to wear fringed leathers and get a tattoo or fly high in the air on your motocross bike, speed down the road in pink on your Sportbike, or tour on your Gold Wing. Not sure what to expect regarding numbers—I know its already exceeding more than I imagined just by the emails and newsletter sign-ups MOTORESS is getting each day! I’m worried about having enough budget to mail the souvenir memento! Why is motorcycling so appealing to you personally, and do you think that’s a common reason why other women ride? Its appealing to me because it’s demanding both mentally and in the ability/skills and it is something that fits with my lifestyle/personality. It’s also an edgy activity, well, the way I tackle it—I’ve always been a thrill seeker and as you are aware by now, have enjoyed much racing. Not all women have this thrill need and in fact there are few willing to venture to the real edge (I underline the real edge), but this is what it is for me. 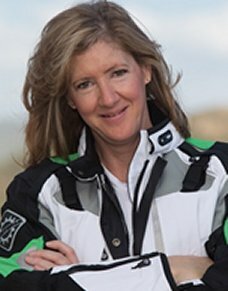 If there is one common reason, women ride being that motorcycling is so individual and we all have our unique reasons, it might be that it expresses and represents a non-limit. Something big, we demonstrate to others, and ourselves we can do. In addition, its such an outlet from everything else considered typical in our female day. What kind of bike/s do you own and ride? Right now I have a new Ducati 1098S. I’m partnered with Ducati North America and I’ve been racing Ducati’s and riding for some years now. I also have a 150cc KYMCO scooter—I think everyone should have one (it’ll go 120km an hour)—it’s a very logical first step for a young female learning to ride. Many seem to laugh when I say I have a scooter—to me, anything on wheels is a blast. Just one year ago before relocating to Toronto, I had a Ducati 900SSC for the street, a Ten Kate Honda CBR600RR for my racing /track, and a Husqvarna 250 two stroke for off roading. Two of these bikes were kept in my kitchen (guess that tells you what kind of a cook I am!). Visit the homepage of Vicki’s new business and personal venture, Motoress, for more inspiration and a true celebration of women who ride! Have comments about NFRD, or have your own take on one of the questions I asked Vicki? Let’s hear ’em!